Over the years we've written Health & Nutrition Bites on nearly a dozen peer-reviewed studies that focus on nuts and their impact on all sorts of conditions, including poor cholesterol scores, cancer, and type 2 diabetes. This doesn't include those articles written about a Mediterranean-style diet, which includes nuts as one of its nine dietary components. Not long ago I wrote about a study of walnuts that suggested that eating nuts would help you reduce your risk of developing type 2 diabetes. This was just the latest of many studies that focus on the benefits of eating various kinds of nuts. These benefits include improving your cholesterol scores with pistachios or any nut, reducing your risk of metabolic syndrome, and increasing your magnesium intake, which helps you avoid type 2 diabetes. What about overall health - at least, in terms of living longer? Scientists from multiple institutions in Massachusetts, from Harvard to the VA in Boston, used data collected through The Physician's Health Study, a large-scale, long-term trial of the effects of aspirin and beta-carotene on the risk of cancers or cardiovascular disease in over 20,000 male physicians. The study includes detailed dietary, health, and lifestyle questionnaires gathered on a yearly basis for nearly ten years. As I've discussed here in this column on more than one occasion, the gold standard for health research is the randomized controlled trial, in which participants are randomly assigned to a test condition or a control condition, and then the outcomes for both groups are compared. When we're talking about diet and nutrition research, in a best-case scenario this would mean that half the participants are assigned to consume a food while the other half avoid that food - and the trial needs to last long enough that any results can be measured. Yet even a randomized controlled trial can be problematic when we're talking about what people eat. Other than keeping people in the lab all the time, how can you be sure they ate what they say they ate? How can you be sure the effects you observe are due to the food you're studying and not something else in their diet? This left the authors with 61 controlled trials and a total of nearly 2,600 participants, and all of the trials provided their participants with the nuts they were to consume, rather than simply instructing the participants to eat the nuts. 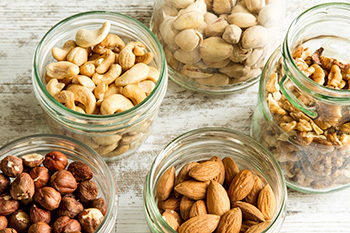 After standardizing the amount of nuts each study provided their participants to a dosage unit of 1 ounce of nuts (1 serving), the authors could compare the cholesterol and blood pressures of those who consumed various amounts of nuts with those who did not. Unsurprisingly, they found that those who ate nuts every day had better total cholesterol and LDL cholesterol (the bad cholesterol) scores, while also having lower blood pressure than those who did not eat nuts. More importantly, however, they looked at which nuts people ate and how much they ate. When they analyzed the results according to dosage, the participants' scores improved somewhat when they ate 1 serving of nuts, but they improved the most when the participants ate at least 2 ounces (2 servings) of nuts per day: eating more than that did not improve scores any further. Even better, from my point of view: it didn't seem to matter which tree nut the participants ate. Nor did it appear to matter what type of overall diet the participants followed: fully half the studies had their participants follow a "habitual diet," while other recommended diets included low-fat, high-fat, American Heart Association, or Mediterranean Diet. The authors caution that they did not look at whether the participants' weight changed as a result of the study they were participating in, which could affect the participants' cholesterol scores and blood pressure. That said, in three-quarters of the included studies the participants were consuming the nuts in addition to their usual diet: they were not cutting calories or fat elsewhere in their diet in order to maintain their customary intake and their usual weight. This makes it less likely that the improved scores were due to weight loss. Eat (tree) nuts; they're great snacks. At least 1 ounce per day, but try for 2 ounces - that's only about a handful (unless you have very small hands). Raw, unsalted nuts are best, but dry roasted and unsalted are good, too. But if you'll only eat them salted, that's fine - just keep the salt to as little as you can. And avoid the candy-coated ones altogether.